Venezuela’s consulate in Miami has a large office space in Brickell, an office that has been untouched and empty for four years. 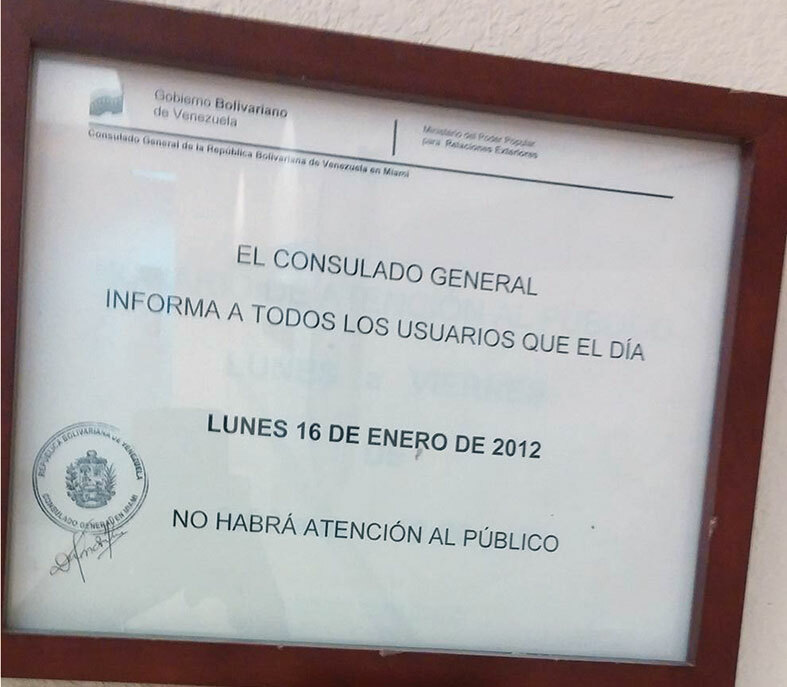 The government of Venezuela withdrew consular personnel from Miami after what they perceived as “extreme concern” for the increase of threats against consular employees. This came after a diplomatic argument in which the late President Hugo Chavez discontinued consular services in retaliation for Washington’s decision to expel Miami Consul General Livia Acosta Noguera after an FBI investigation showed allegations that she was involved in a cyber-attack against the US. A statement posted on the front door of the vacant consulate explains the withdrawal, blaming the US government for threats. The 7,940-square-foot Venezuelan office, however, is contracted for a ten-year lease. The Venezuelan government is still paying the rent to Florida East Coast Realty, owners of the building, and the space on the fourth floor of 1101 Brickell Ave. has not been used since the staff’s departure. The statement on the office door also blasted Univision, whose investigative report subsequently led to the FBI’s recommendation of considering the consul general persona non grata, as an organization with no credibility. At first, the Venezuelan government refused to pay rent after it left the space but after Tibor Hollo, president of Florida East Coast Realty, threatened to sue, the government resumed paying rent. Mr. Hollo was not available for comment but told the Miami Today last year that Venezuela was still paying the rent. Building leasing agents also would not comment. Ha! Love it! Way to go, Tibor!